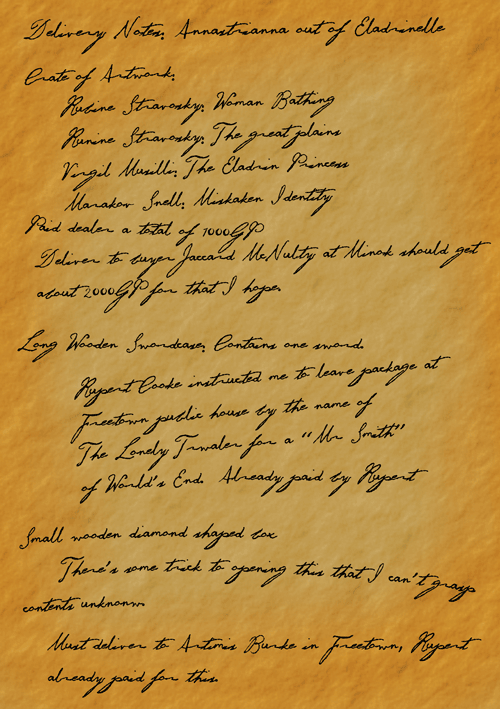 This manifest was found in the Captain's cabin, aboard the ship Annastrianna. Deliver to buyer Jaccard McNulty at Minok should get about 2000GP for that I hope. Long Wooden Swordcase: Contains one sword. Rupert Cooke instructed me to leave package at Freetown public house by the name of The Lonely Trawler for a "Mr Smith" of World's End?. Already paid by Rupert?. There's some trick to opening this that I can't grasp, contents unknown. Must deliver to Artemis Burke? in Freetown, Rupert? already paid for this.